The likelihood P(ai|si,R) is just πR(s)[ai], where πR is the optimal policy under the reward function R. Note that computing the optimal policy given the reward is in general non-trivial; except in simple cases, we typically approximate the policy using reinforcement learning (see Figure 1). Policies are usually assumed to be noisy (e.g. using a softmax instead of deterministically taking the best action). Due to the challenges of specifying priors, computing optimal policies and integrating over reward functions, most work in IRL uses some kind of approximation to the Bayesian objective (see the references in the introduction for some examples). As we noted above, applications of IRL typically infer the reward function R from observed samples of the human policy π∗. Formally, the environment is a known MPD∖R=(S,A,T) and the observations are state-action pairs, (s,a)∼π∗. This assumes that (a) the environment’s dynamics T are given as part of the IRL problem, and (b) the observations are structured as “state-action” pairs. When the data comes from a human expert parking a car, these assumptions are reasonable. The states and actions of the driver can be recorded and a car simulator can be used for T. For data from YouTube videos or history books, the assumptions fail. The data is a sequence of partial observations: the transition function T is unknown and the data does not separate out state and action. Indeed, it’s a challenging ML problem to infer human actions from text or videos. To infer actions from observations, some model relating the true state-action (s,a) to the observed video frame must be used. But choosing any model makes substantive assumptions about how human values relate to their behavior. 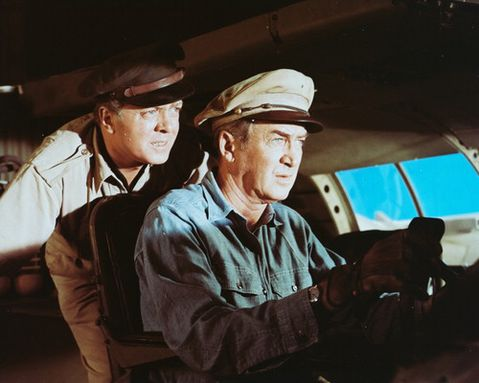 For example, suppose someone attacks one of the pilots and (as a reflex) he defends himself by hitting back. Is this reflexive or instinctive response (hitting the attacker) an action that is informative about the pilot’s values? Philosophers and neuroscientists might investigate this by considering the mental processes that occur before the pilot hits back. If an IRL algorithm uses an off-the-shelf action classifier, it will lock in some (contentious) assumptions about these mental processes. At the same time, an IRL algorithm cannot learn such a model because it never directly observes the mental processes that relate rewards to actions. 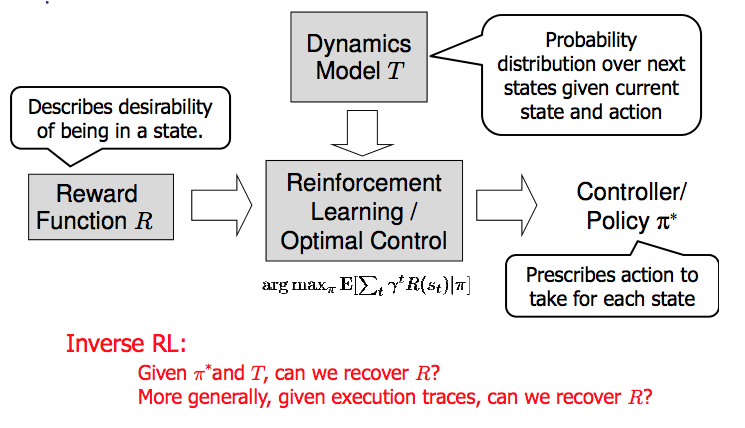 When learning a reward function via IRL, the ultimate goal is to use the reward function to guide an artificial agent’s behavior (e.g. to perform useful tasks to humans). This goal can be formalized directly, without including IRL as an intermediate step. For example, in Apprenticeship Learning, the goal is to learn a “good” policy for the MDP∖R from samples of the human’s policy π∗ (where π∗ is assumed to approximately optimize an unknown reward function). In Imitation Learning, the goal is simply to learn a policy that is similar to the human’s policy. Someone travels from their house to a cafe, which has already closed. If they are assumed to have full knowledge, then IRL would infer an alternative preference (e.g. going for a walk) rather than a preference to get a drink at the cafe. Someone takes a drug that is widely known to be ineffective. This could be because they have a false belief that the drug is effective, or because they picked up the wrong pill, or because they take the drug for its side-effects. Each possible explanation could lead to different conclusions about preferences. Suppose an IRL algorithm is inferring a person’s goals from key-presses on their laptop. The person repeatedly forgets their login passwords and has to reset them. This behavior is hard to capture with a POMDP-style model: humans forget some strings of characters and not others. IRL might infer that the person intends to repeatedly reset their passwords. The above arises from humans forgetting information — even if the information is only a short string of characters. This is one way in which humans systematically deviate from rational Bayesian agents. The field of psychology has documented many other deviations. Below we discuss one such deviation — time-inconsistency — which has been used to explain temptation, addiction and procrastination. An IRL algorithm is inferring Alice’s preferences. In particular, the goal is to infer Alice’s preference for completing a somewhat tedious task (e.g. writing a paper) as opposed to relaxing. Alice has T days in which she could complete the task and IRL observes her working or relaxing on each successive day. Formally, let R be the preference/reward Alice assigns to completing the task. Each day, Alice can “work” (receiving cost w for doing tedious work) or “wait” (cost 0). If she works, she later receives the reward R minus a tiny, linearly increasing cost (because it’s better to submit a paper earlier). Beyond the deadline at T, Alice cannot get the reward R. For IRL, we fix ϵ and w and infer R.
Suppose Alice chooses “wait” on Day 1. If she were fully rational, it follows that R (the preference for completing the task) is small compared to w (the psychological cost of doing the tedious work). In other words, Alice doesn’t care much about completing the task. Rational agents will do the task on Day 1 or never do it. Yet humans often care deeply about tasks yet leave them until the last minute (when finishing early would be optimal). Here we imagine that Alice has 9 days to complete the task and waits until the last possible day. 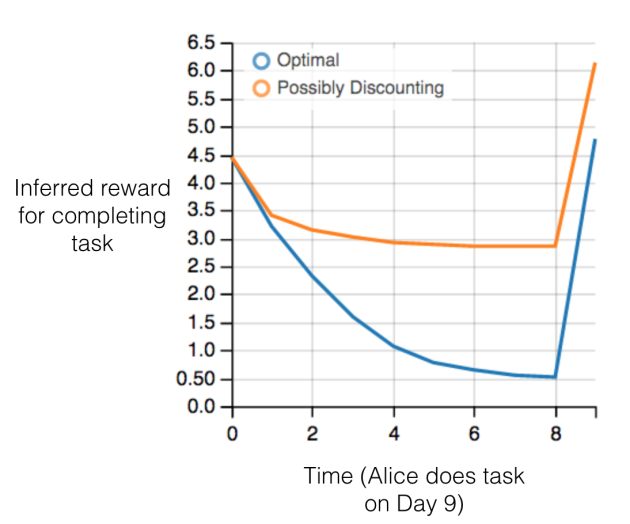 Figure 3: Graph showing IRL inferences for Optimal model (which is mis-specified) and Possibly Discounting Model (which includes hyperbolic discounting). On each day (x−axis) the model gets another observation of Alice’s choice. The y−axis shows the posterior mean for R (reward for task), where the tedious work w=−1.